Is it snowing in Ehrwald ?¡Gracias! 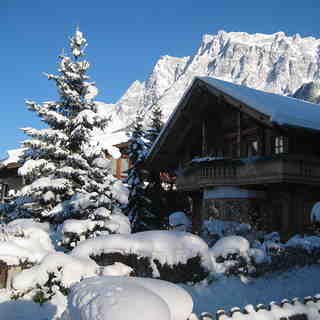 Ehrwald is a nice little village in the Zugspitze arena. However, it is a bit overrun with cars at the start and end of the ski-day. 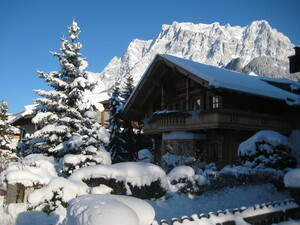 Ehrwald is situated next to two (small) ski areas that are good for beginners and intermediates. There are busses to other Zugspitze ski-areas but they don't run that often. At night, Ehrwald is very pleasant and rustic. Further information about Ehrwald, for our notes, is welcome. Just returned from a week in the Zugspitze Arena of which Ehrwald is part. Only a small area but had great snow and the lack of traffic meant that the piste remained in great condition. Access to the glacier is far easier than long queues at Eibsee on the German side and Lermoos offers reasonable vertical across the valley. Garmisch-Partenkirchen is only 20 minutes away and is on the same lift pass and offers the Kandahar WC Downhill to blast down. Good alternative week away all in all.